Gardeners have always been inspired by different forms of fantasy. The Fantasy Collections explores different aspects of this theme; cultural, botanical, artistic and historical fantasy are all represented. Hamilton Gardens is in the process of creating five new gardens within four years. So far, we have opened three gardens: the Tudor Garden opened in 2015, the Concept Garden opened in 2018 and the Mansfield Garden recreating the famous fictional garden in Katherine Mansfield’s short story The Garden Party opened in November 2018. We have two more gardens within the initial group to complete; the Picturesque Garden and the Surrealist Garden. 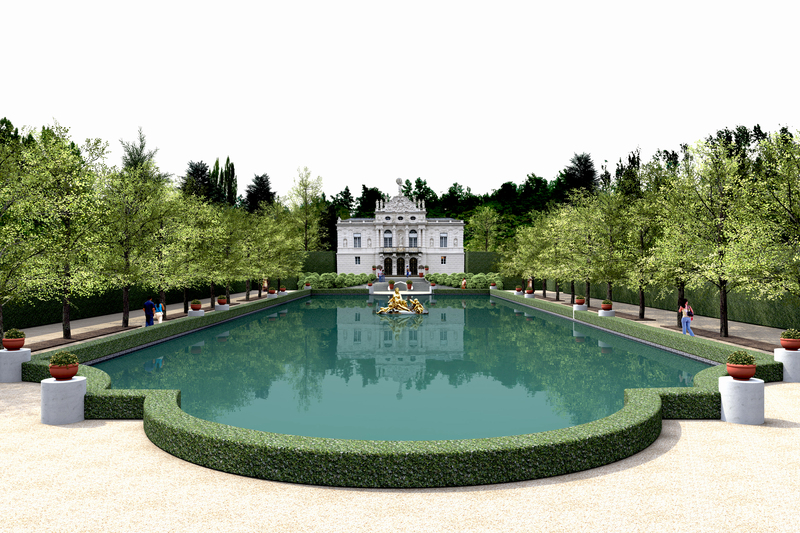 In 2018, a further two gardens were approved for the Fantasy collection; the European inspired Medieval Garden and the dramatic Baroque Garden. 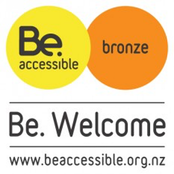 More information on other developments are availble here. 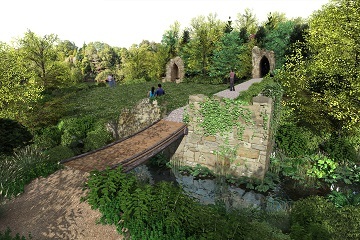 Each garden will support Hamilton Gardens’ inspirational concept of telling the story of gardens through time and space. 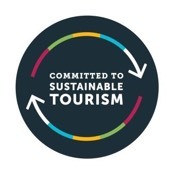 The Gardens is the Waikato’s most visited tourist destination and this ambitious proposal aims to enhance the Gardens’ international reputation, provide a beautiful public park for Hamilton residents and bolster visitor numbers to the region more information. Download a copy of the Hamilton Gardens Development Project brochure. The popular 18th Century picturesque garden movement was inspired by painting and a new appreciation for wild romantic landscapes. While these gardens usually respected the site and local flora, they often introduced an artificial site history such as Arcadian ruins and hermit’s caves set in a natural landscape. The garden will border the Waikato River providing visitors with occasional views down to the river. This garden will include many conventional garden features, however everything will be five times the normal size. The large lawn of this garden will also be suitable for concerts and special events. However what will really set this garden apart are the giant topiary figures that have become known as the ‘Trons’. These mysterious, surrealist figures will range in height from five to eight metres and occasionally, just out of the corner of your eye, you might even see them move. The oversized flowers may even talk to you. Most European medieval and early renaissance gardens were inspired by a very influential French poem called 'Roman de la Rose'. 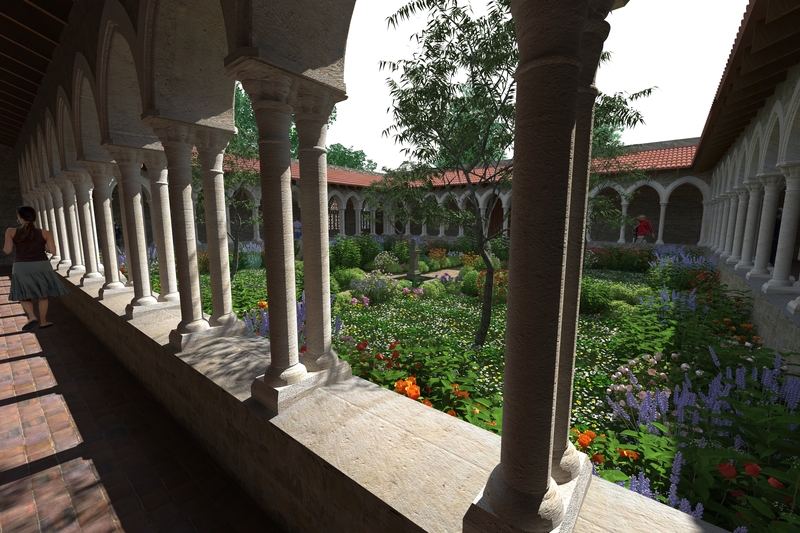 This recreation of a 13th-century courtyard garden would typically include reference to the poem and various Christian symbols. A high stone wall would enclose a court with fruit trees, turf benches, a collection of herbs, a 'flower mead' and the central fountain. In the far corner, a window will provide a glimpse of the contrasting form of the minimalist cloister garden. During the 18th and 19th centuries, European royalty developed dramatic theatrical gardens that included the elements of stage set design. These gardens weren’t just used for theatrical events, they provided a setting for important people to dress up in expensive cloths and powdered wigs and be seen. This German or Austrian form would feature a Rococo / Baroque façade, large reflecting pool and two sculptural groups. Of all the gardens this possibly has the most direct association with classical music. 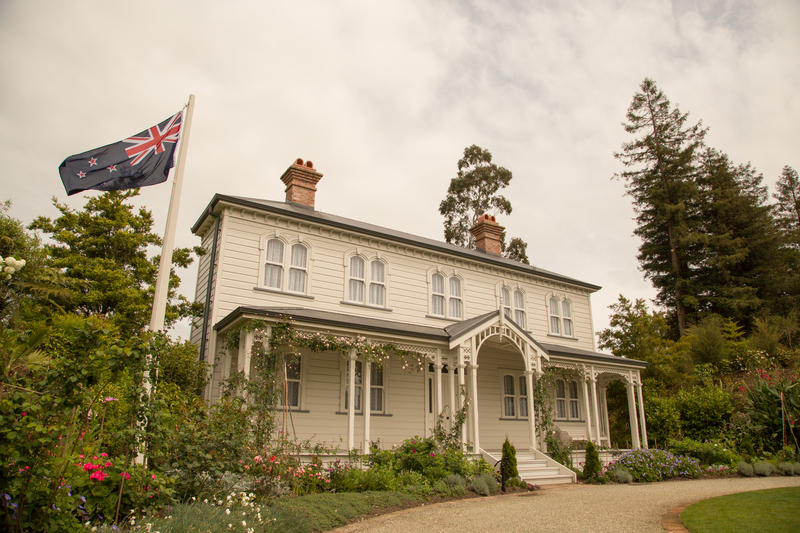 A recreation of the early 20th Century NZ Garden described in Katherine Mansfield’s famous short story ‘The Garden Party’. Elements included from her description will be recreated such as the tent on the tennis court in front of a karaka hedge, the lily pond and the long tables covered in crisp white tablecloths with 15 kinds of sandwich and cream puffs. The garden will include the frontage of a late 19th century villa and planting that was popular at that time. 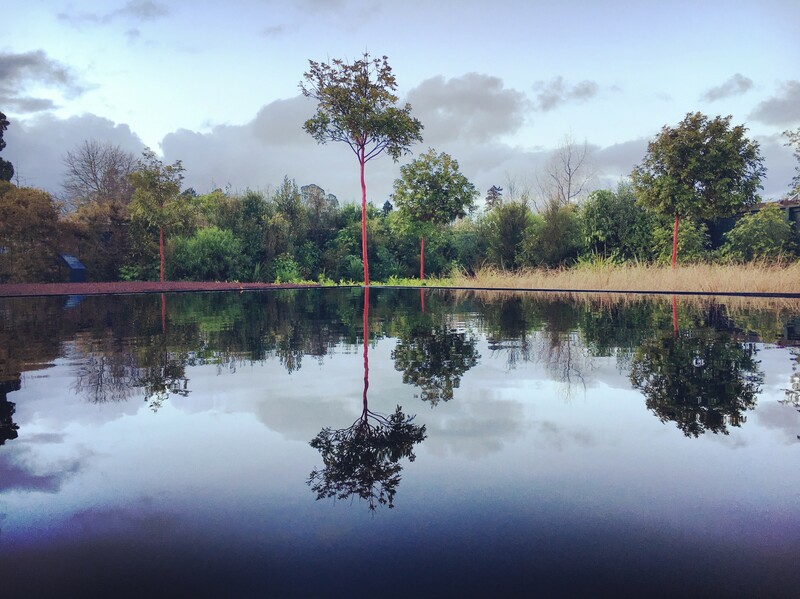 A significant new movement in garden design appears to be the conceptual gardens which have effectively become an extension of conceptual art. Not necessarily practical or beautiful but making a statement or a message that the viewer must decipher. Like most well-known examples this garden will refer to the landscape in which it sits with the theme of an old whakatauki subtitle - “He peke tangata, apa he peke titoki”. (The human family lives on while the branch of a titoki falls and decays). A particular inspiration for 16th English renaissance gardens where the patterns of Celtic knots, monastic book illustrations and their contemporary decorative arts such as embroidered textiles. 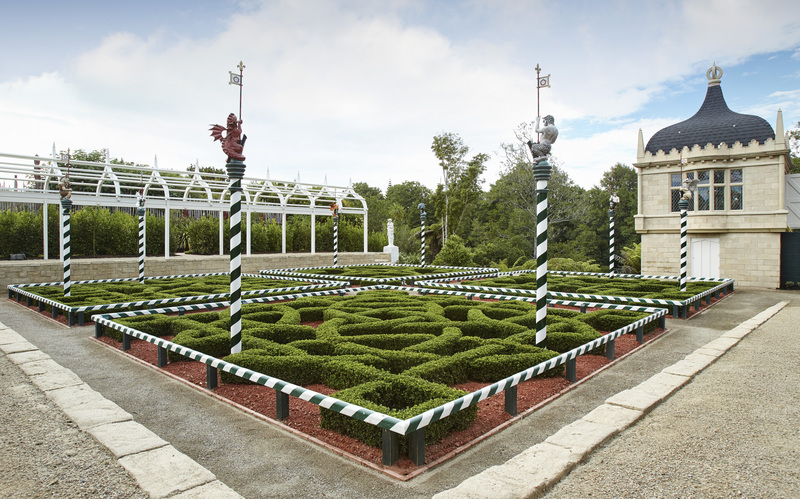 One of the best known patterns has been recreated in this knot garden. Other typical features incorporated into this garden are the raised gallery overlooking the knot garden, the shipbuilders’ arbour, Elizabethan wall and the small banqueting pavilion. Also typical were the fantasy beasts on striped poles. In this garden they hold the coat of arms of famous Tudor personalities.